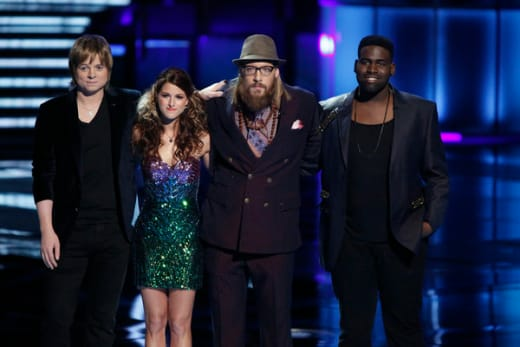 The Voice Results: Who Made the Finale? Tuesday night on The Voice was highlighted by the return of three of last year's talents, way too much conversing with the coaches and a result that was less than surprising. After a recap of Monday's performances, and one of many wordy chats from the coaches on their thoughts and feelings, Cassadee and Terry teamed up for a very nice if less than amazing performance of "Little Talks." It was then time for the first returning contestant to take the stage. Juliet Simms, although eventually got into a rhythm by the end of her performance, made me wondering at the beginning if she was actually the same girl I was rooting for throughout the entirety of last season. Finally, it was time to learn who the first semifinalist to move on would be. It was...Terry McDermott! I'm a bit surprised they announced him first, but he has been very solid over the past two weeks, so I'm glad he's made it through. To the stage next was last year's country firecracker RaeLynn. Unlike Juliet's performance, this was probably better than anything Baby Annie did last season. I think she definitely has a chance to make it in this business. Later on Chris Mann also performed for America, and the smooth opera singer did just fine. It's definitely obvious after tonight that The Voice has had some talent the past couple years. Who was next to make the finale? Carson Daly announces that it is...Cassadee Pope! Well if she didn't make it to the final three after hitting number one on the iTunes Chart, I would have been surprised. The final performance of the night came from the two contestants who were still awaiting their fate, and I'm going to credit this boring rendition of "Hero" to that fact. Following yet another chat with the coaches, this one with all of them taking up too much time, the last announcement was made. Making next week's finals is...Nicholas David! That means that Trevin Hunte will be going home. I'm very pleased with the three contestants chosen to move on. Would I have preferred Amanda Brown to be there instead of Terry? Probably, but we're really picking nits at this point. Three quality singers are in contention for the championship, and to be honest, I'd take any of the three over last year's winner, Jermaine Paul. The Voice is in good shape going into next Monday's final performance show. What did you all think of the results? Did America get it right? Yes! No, Trevin should have stayed! When does American Idol start?